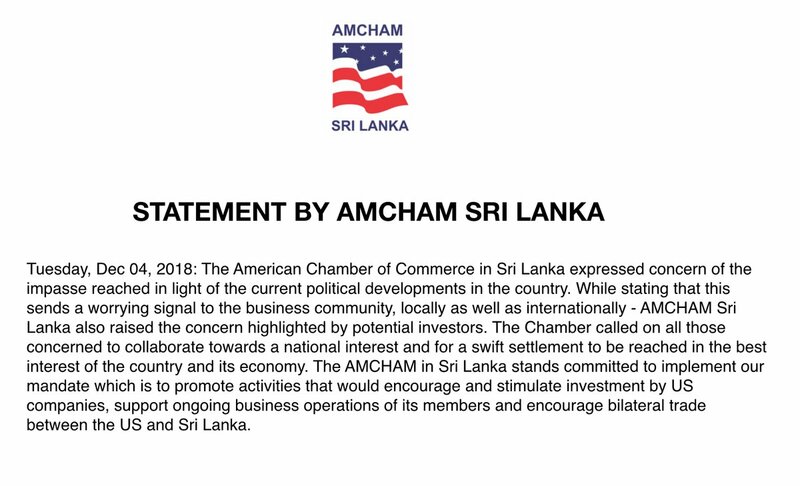 The American Chamber of Commerce in Sri Lanka (AmCham) today called for an end to ongoing political crisis in the country. In a statement that followed today's downgrading of Sri Lanka by Standard and Poor, and Fitch Rating's, AmCham said it "expressed concern of the impasse reached". "While stating that this sends a worrying signal to the business community, locally as well as internationally - AMCHAM Sri Lanka also raised the concern highlighted by potential investors. Sri Lanka’s political crisis has continued for over a month after President Maithripala Sirisena appointed Mahinda Rajapaksa, who oversaw a military offensive that killed tens of thousands of Tamils, as prime minister. The ensuing crisis has led to widespread turmoil, with several international figures calling for talks on sanctions, the withdrawal of trade benefits and loans to Sri Lanka put on hold.